The House Permanent Select Committee on Intelligence has just publicly released its final report on Russian interference in the 2016 presidential election. 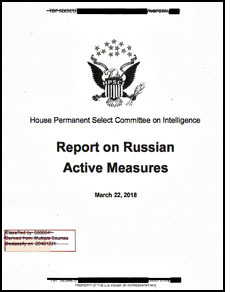 Here is a link to the redacted report entitled Report on Russian Active Measures. ADDENDUM: 04-28-2018 – Here is a link to the 96-page Minority Views commentary about the HPSCI final report linked above. Are you able to explain why, apparently, the Mueller budget is not available to the public? However, here is a link to the most recent (probably only) Special Counsel Spending Report released to date. Also, here’s a link to a Politico (hold your nose) article that may help cloudify an otherwise clearly confusing issue. According to this particular skews medium story, The Federalized Lynch Mob budget was $10,000,000 (gratuities not included).